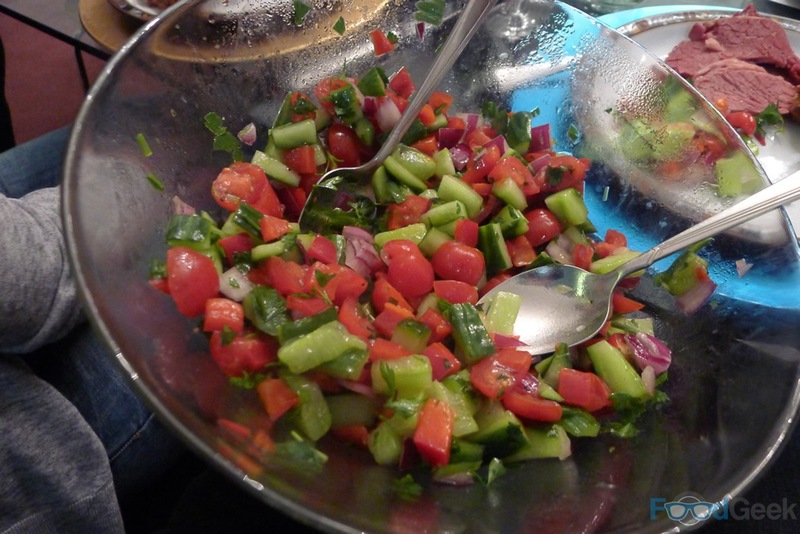 It was my third time at one of Sue Waxman’s ‘Chicken Soup for the Soul’ supper clubs at her home in Prestwich. The first absolutely blew me away but by her own very high standards the second wasn’t quite as good. 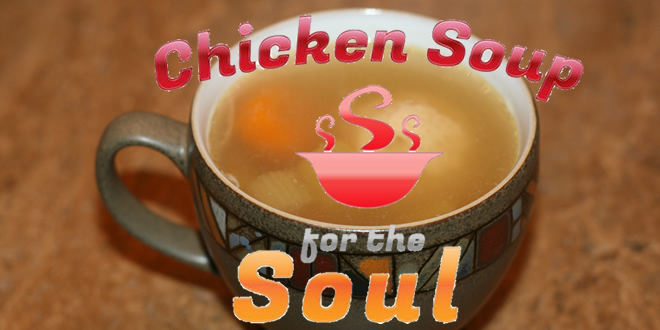 Thankfully, the third, ‘Jewish Soul Food’ was almost as good as the original. Beisdes a couple of mainstay dishes, most of the menu has changed each time. There’s one thing I hope never changes though. 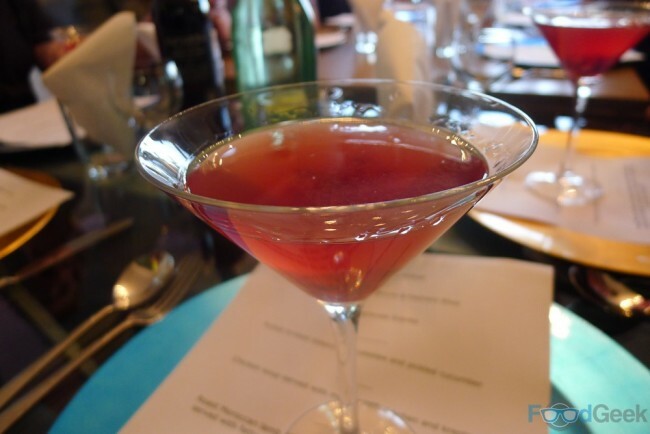 I just love the boozy, fruity, sweet and sour ‘Pomegranate Cosmopolitan’ too much. 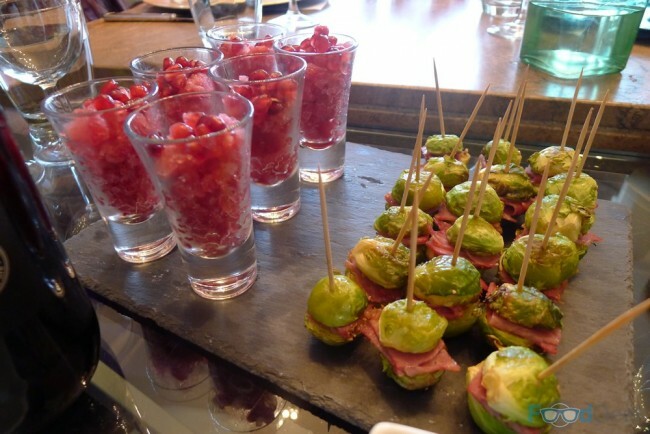 The cocktail was shortly followed by little ‘Brussels Sprouts & Pastrami Bites’ and more pomegranate, this time in the form of a refreshing ‘Pomegranate Granita’. 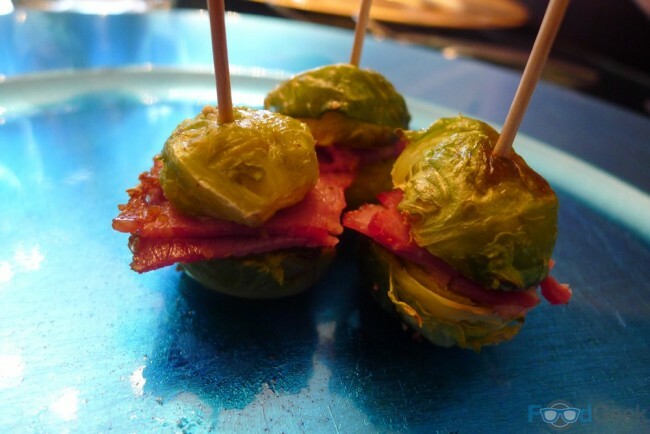 The combination of sprouts and bacon is one of my favourites things. 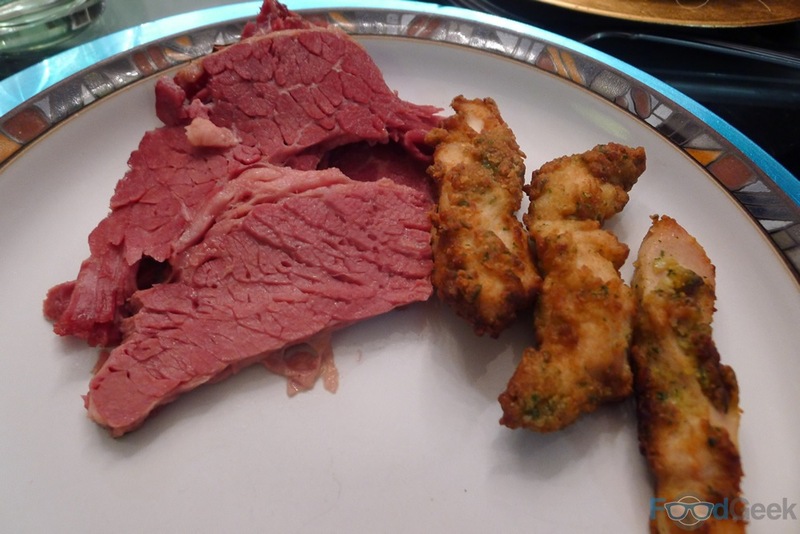 Pastrami worked similarly well, combining them in a cute bite-sized snack is very clever (and something I may be stealing at Christmas). 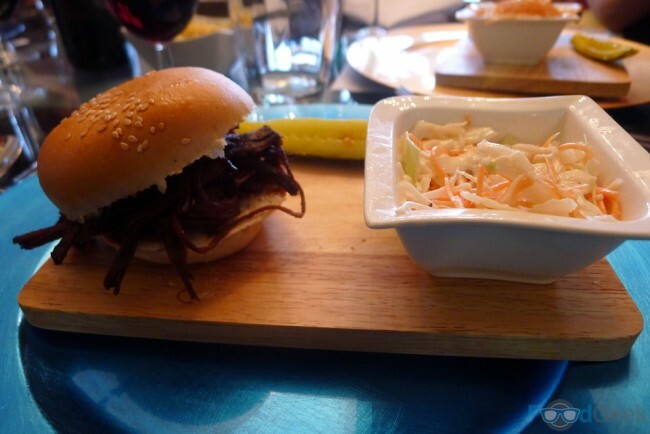 Next, a generously sized bun (for a slider at least) stuffed with pulled brisket, served with coleslaw and a large slice of pickled cucumber. The meat was perhaps a touch dry but adding the coleslaw to the bun made for one tasty sandwich. The main event was once again Sue’s famous ‘Chicken Soup’. It was quite badly under-seasoned last time but there were no such concerns here, it was well and truly back to its former glory. 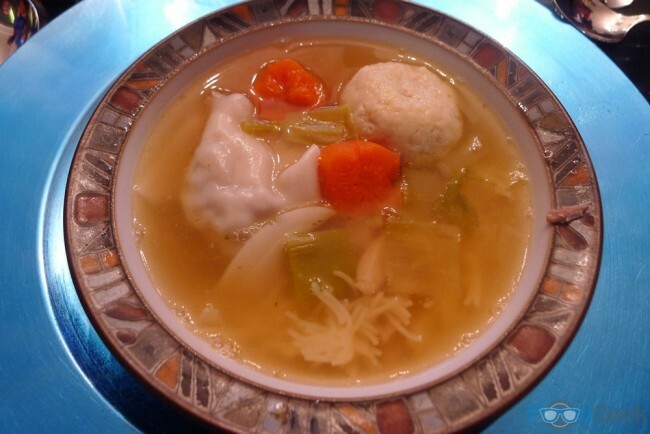 The rich, meaty almost clear broth is full of flavour and interesting things; a matzah ball, lokshen (Jewish vermicelli) and kreplach (dumpling). Main course started with a plate of stunning ‘Salt Beef’ and intriguingly delicious ‘Falafel Crusted Chicken Goujons’. To which we helped our self from copious other dishes brought to the table. 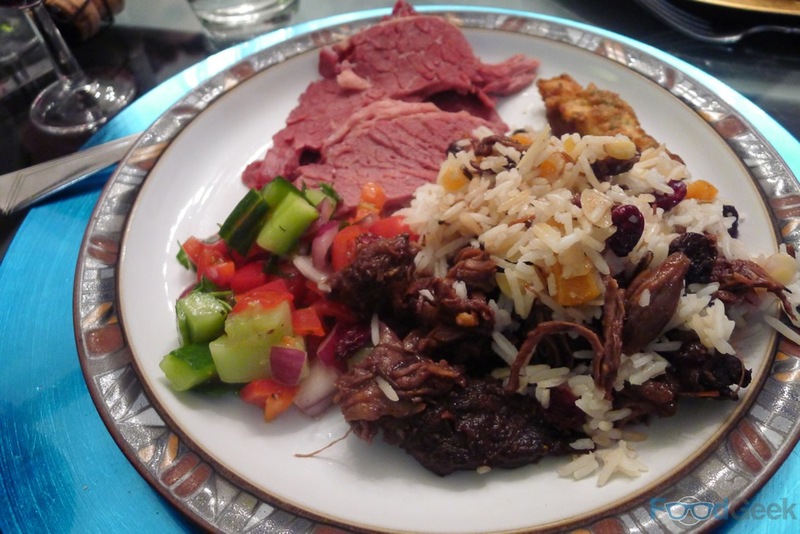 There was ‘Jewelled Rice’ topped with succulent and spicy ‘Moroccan Roast Lamb’. 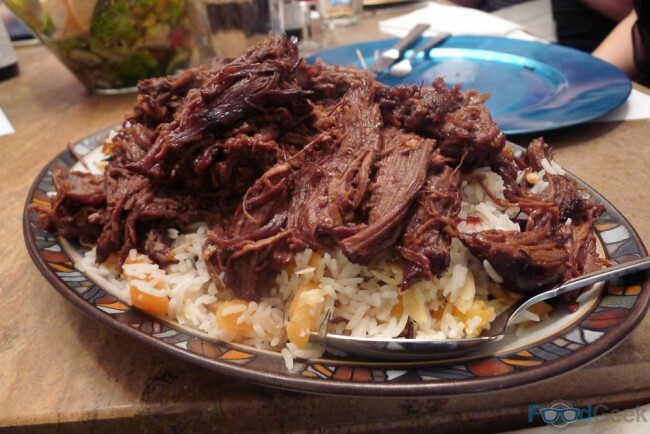 The rice studded with a variety of gem like nuts and dried fruit. A basic ‘Rocket Salad with Tahini Vinaigrette’, ‘Fattoush’, a green salad with crispy chopped pitta bread and ‘Israeli Salad’, a chopped tomato and cucumber salad, which is apparently the “most well known dish in Israel”. It made for a hearty main course full of exciting tastes and textures. 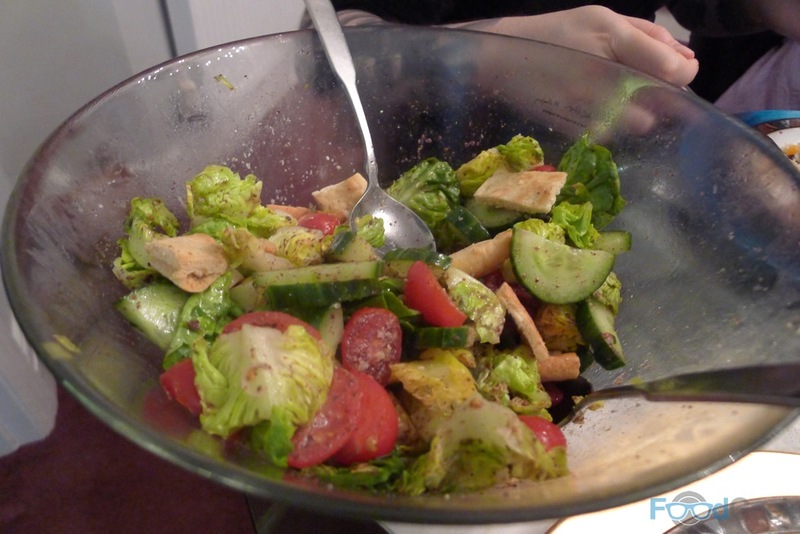 Despite eating a lot of meat it actually felt fairly light thanks to all the salad. 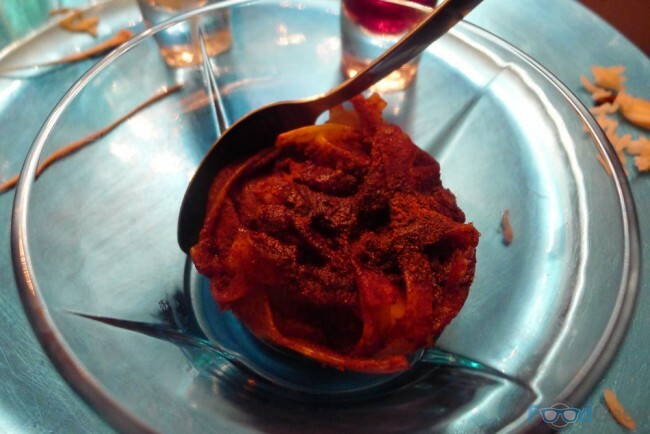 I had no idea what to expect from the dessert, ‘Lokshen Pudding’. I only knew lokshen as the little noodles in Sue’s chicken soup, so it seemed a bit weird making a pudding from pasta. It was certainly an unusual dessert but one I enjoyed eating very much. The noodles are crisp on the outside but still soft and moist inside. Now that I think about it, it’s no weirder than something like rice pudding. 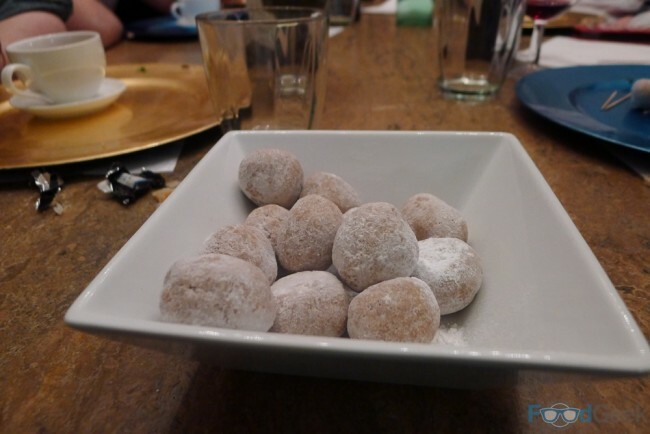 We finished with coffee and more of the fantastic ‘Cinnamon Balls’ I liked so much last time. All in all it was another brilliant night. The food was great, almost as good as the first time and the company was equally good. Sue and husband Ian were the perfect hosts, as ever. I missed Sue’s last supper club but will definitely be looking out for future dates. I just wonder how many dishes she has left in her repertoire that I’m yet to try?